Intel has announced expansion of its lineup of 9th generation desktop CPUs by introducing six new CPUs with F and KF monikers. While both F and KF series have their iGPUs disabled, the KF series is overclockable. These new CPUs include the Core i3-9350KF, Core i5-9400F, Core i5-9400, Core i5-9600KF, Core i7-9700KF, and the Core i9-9900KF. Intel also announced that mobile versions of these CPUs will be coming in Q2 2019. Last month, leaked slides from Gigabyte's internal presentation hinted at the imminent arrival of F and KF variants in the Intel 9th generation lineup. We also saw a few retailers briefly put up listings for these CPUs before taking them down. Now, at CES 2019, Intel has announced that it is introducing no less than six new CPUs starting from the base Core i3 all the way to till the Core i9 SKU. 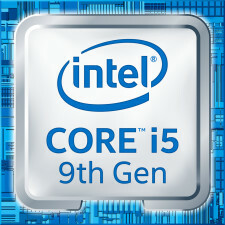 These include the Core i3-9350KF, Core i5-9400F, Core i5-9400, Core i5-9600KF, Core i7-9700KF, and the Core i9-9900KF. Here, the K signifies an unlocked chip, F refers to chips with disabled iGPU, and KF refers to unlocked chips with disabled iGPUs. The Core i9-9900KF, the Core i7-9700KF, and the Core i5-9600KF are very much identical to their K counterparts with the only difference being that these new SKUs have their integrated GPUs disabled. The Core i3-9350KF, the Core i5-9400F, and the Core i5-9400 are entirely new processors, though. The Core i5-9400 and the Core i5-9400F feature identical specs: 6C/6T, 2.9 GHz base, 4.1 GHz boost (locked), and a 65W TDP. The only difference is that the Core i5-9400F has the iGPU disabled. The Core i3-9350KF, on the other hand, is a 4C/4T part with a 4 GHz base and a 4.6 GHz boost. This SKU does not offer integrated graphics, but is unlocked and can be overclocked. Intel's rationale to launch CPUs with integrated graphics disabled is not very clear at the moment. These CPUs could be cater to those who prefer using dedicated GPUs and also in a bid to improve binning and yield. The benefits, if any, to overclocking will be only be evident when we get to take these chips for a test drive. That said, there is no concrete confirmation on when these CPUs would hit the market. Intel 'expects' shipping by end of January but it could be much later as well. However, Intel did confirm that mobile versions of the 9th generation CPUs will be shipping from Q2 2019.